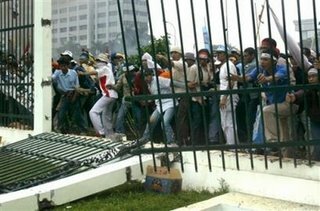 Jakarta, Indonesia - Some 40,000 Indonesian workers broke down the gates of Parliament and attempted to storm the building, but were held off by police with tear gas and water cannons. The workers also built a number of bonfires around the government building and destroyed a toll road in the city center. The demonstrators were protesting a new labor reform law that limits workers' right to go on strike and takes away job security from employees who haven't been on a job for at least five years. The legislation was meant to further open up the country up to multinational corporate development, but the government is already backing down in the face of such massive opposition.